At February's Estee Lauder spring media preview, there were pretty palettes, new lipsticks, and lovely nail lacquers galore. But the launch I was most excited about was the Clear Difference skincare line, which comprises three products designed for adult acne sufferers and sounds like the answer to my recent skin troubles' prayers. 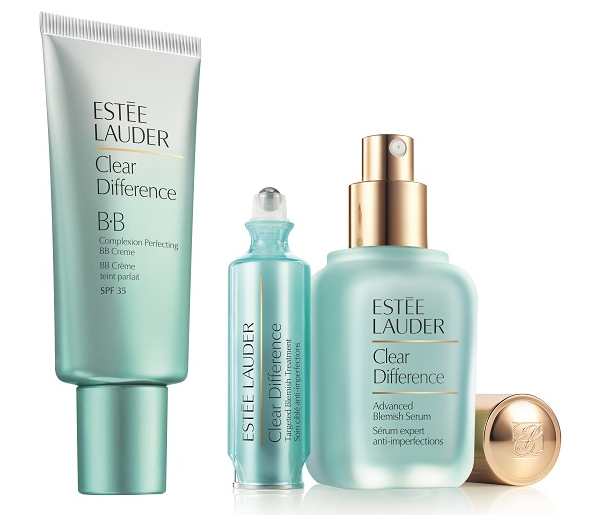 In the last two months of testing, all three Clear Difference products have certainly lived up to their name and noticeably improved my complexion. First, there's the Advanced Blemish Serum ($64-98), a lightly hydrating, day-or-night, quick-absorbing serum that contains 0.5% salicylic acid to gently fight blemishes. The texture and scent leave skin feeling refreshed and soft after cleansing and toning. Then there's the Targeted Blemish Treatment ($38), which packs a higher concentration of salycylic acid to stop burgeoning blemishes in their tracks. The clear gel does sting a little immediately after I apply it with the rollerball applicator, but the results are worth it. I've noticed smaller breakouts disappearing after 2-3 overnight applications, while larger ones never reach the painful, inflamed, takes-at-least-a-week-to-shrink state. The Complexion Perfecting BB Creme ($46) protects skin and evens tone with its oil-free, SPF 35 formula. It's a bit thicker and more matte than most BB creams I've tried, so using a little and blending carefully are musts. So why has it taken me this long to write the product review if the preview happened in February? I needed to see if the products could withstand the hormone-induced blemishes brought on by that time of the month. Usually I get at least two or three painful, inflamed pimples, but not lately. Indeed, the difference is clear, and I'm definitely a fan. Wow .. seems like a good line! I'm still suffering from acne in my adult years (grrr..) so I may have to check this line out. I love the BB Cream. I've been breaking out from all the traveling, and it really works. My sample's already at the halfway mark. I'm going to be very sad when it runs out.